As 2009 comes to a close, many of your are pining for some upgrades around your church facilities. We decided to see just where our readers are longing for an upgrade the most. We have a faraway winner for facility most in need of a facelift. 31% of you would upgrade your church’s youth facilities. Turns out your students don’t enjoy meeting in your church’s original sanctuary from 1846, and you’d like to get them a place to call their own. Next up, 15% of you need a church office upgrade. Your terrible day-to-day facilities aren’t making actual ministry any easier. And for another 12% of you, the facility you’d most like to upgrade are your, ahem, facilities. You’d like to bring your church restrooms up to par and make them a place people love to visit. The next biggest sources of pain are your parking lots and pews. Between sitting for an hour and then staying in gridlock, you’re going to lose your religion. You’d love to devote some resources to new seating (or at least cushions) as well as parking lot infrastructure and volunteers. 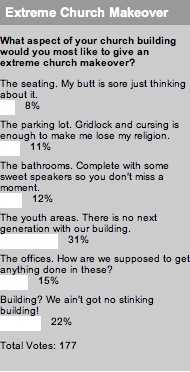 And finally, 22% of you don’t have any of these concerns because you don’t have a building. Perhaps you meet in a home or you rent a building, but either way, you’re whistling “Hakuna Matata” while the other 78% choose an answer. This week’s poll is a bit more controversial; In the spirit of holiday debate and division, how important is the war between “Merry Christmas” and “Happy Holidays” to you? Click on through to weight your vote. I would like to see an article on the philosophy of communcation. Nowadays many of our churches are seeing a drop in attendence since most people in this post-modern society don’t see “going” to church on Sunday as a priority or expectation. Our churhes really need to get outside the four walls of their building and get into the community and into the surrounding culture to make a difference and build relationships with those around them. I love this blog but I was kind of disappointed to see a poll that is concentrating on the facilities of our ministry rather than the actual ministry.